As experts in the tiling industry, we have come across many questions throughout our many years in business. 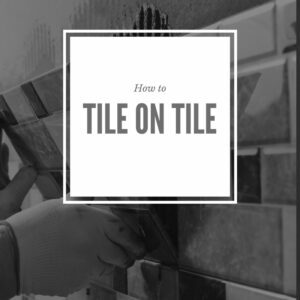 In this article, we’re answering the question: “Can you tile on top of wall tiles?”. Can you tile on top of wall tiles? So how do you tile on top of tile? Make sure the existing tiles are securely fixed to the floor or wall surface. You can tap them lightly with a coin and listening to the sound to make sure they are firmly in place before tiling on top of them. Tip: How do you know if a tile is loose? You’ll hear a hollow sound when you tap the tile. Remove any loose tiles and re-apply the tiles with thin set mortar. Even out any uneven surface on the tiles. Level out the tile surface using a right-angle grinder and masonry wheel to grind down any points that are higher amongst the tiles. Remove any loose grout with a rotary tool. Vacuum the tiles and use detergent to clean them, rinse with water and leave them to dry. Before spreading the adhesive make sure you use a good acrylic primer and leave to dry, using some sand in the primer will add an additional key . Use a latex- modified thin set mortar when applying new tiles onto existing tiles. Make sure to make-up the mortar in small amounts at a time to avoid it drying up and becoming lumpy or covered in a set film. Make sure you spread the adhesive over the whole tile, pay particular attention to this when you are applying large tiles onto existing tiles. Tip: Always apply the adhesive in one direction, using a notched trowel. Push the tile firmly in place and slide about 3mm and back again, complete the application process with the rest of the tiles. Once all the tiles have been applied, follow the usual drying procedure and grout using the usual grouting method. Wipe off any excess grout and adhesive with a sponge. Clean the tiles once dry. Can you put tile on drywall? You can apply tiles directly onto drywall. Make sure you remove any grease from the drywall before you apply your tiles, prime with acrylic primers, leave to dry. Can tile be installed over painted drywall? You can tile over painted or unpainted drywall, as well as textured wall surfaces and plaster. You cannot, however, tile over wallpaper, lead paint, plywood walls or glossy surfaces. Can you put a tile backsplash over tile? A backsplash essentially describes the material used to cover the part of the wall between the top of the kitchen counter and the upper cabinets. A tile backsplash tends to work well when tiling on tile since the increased thickness tends to work well between the countertop and the wall. 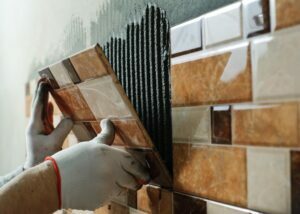 At UK Pro Tiling Training, our 9-day tiling course will equip you to be prepared for any aspect of your tiling project, including how to tile on tile.